Purdue University marks its 150th anniversary in 2019. 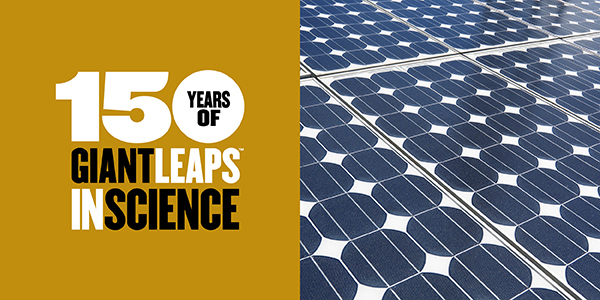 From September 2018 through September 2019, the College of Science joins Purdue in celebrating groundbreaking footprints in science that lead to giant leaps in discovery. 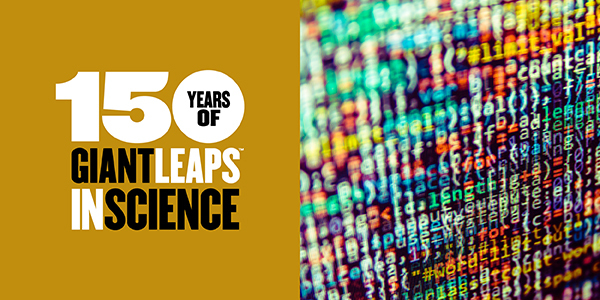 We invite you to #takegiantleaps with us at College of Science 150th events throughout the year and in our ongoing conversation about the future of Purdue Science. The College is a monthly feature unit for the Purdue 150th kickoff in September 2018 and sponsor of the Sept. 22 Homecoming game — the field for the opening ceremonies of the Purdue Sesquicentennial. What if our footprints in science determine what the future holds? What role will we play in defining humankind’s space beyond Earth? How can we ensure the responsible development of machine learning? How will new technologies bring more precise cures? What environmentally smart fuels might launch us to the future? 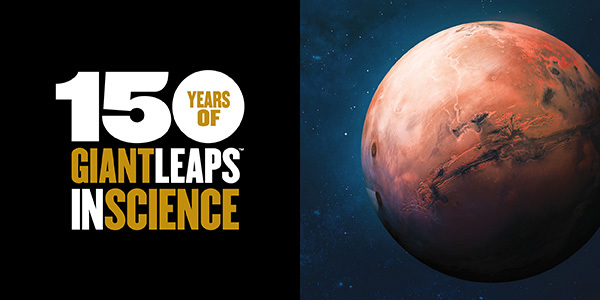 Purdue scientists are on the front lines of these four themes of Purdue University’s Sesquicentennial anniversary campaign — 150 Years of Giant Leaps — navigating the evolution of space exploration, automation and artificial intelligence, research advances in the life sciences, and ideas that support a sustainable tomorrow. These four themes will be part of several Purdue 150th Ideas Festival events throughout the Sesquicentennial. What if there is space for humankind beyond Earth? Purdue Science student, faculty, and alumni researchers are tackling the questions that will determine our relationship with the outer reaches — working with NASA Mars Rover missions to look for signs of ancient microbacterial life on the red planet, discovering the true makeup of the moon and potential lunar cities, understanding the Higgs boson, searching for dark matter, uncovering new elements in nebula and supernovae, and suiting up for space missions that explore the geoscience of sustainability in space. What if artificial intelligence becomes our best ally — or our worst enemy? Purdue Science student, faculty, and alumni researchers are asking the critical data science questions that will test the balance of humanity and technological innovation. Through the Purdue Integrative Data Science Initiative and research collaborations across campus and the globe, we're exploring new possibilities in machine learning, network algorithms, and automation that will shape every aspect of our lives. Only we can determine how to use these incredible advancements for the greater good. What if cancer finally meets its match? Purdue Science student, faculty, and alumni researchers are developing new drugs, diagnostics, and therapeutics that are paving the way toward understanding and eradicating cancer, AIDS, Alzheimer's, malaria, and a host of diseases. 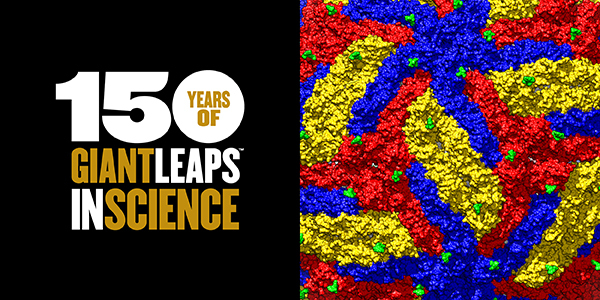 Purdue scientists were the first to discover the structure of the Zika virus and are pioneering new research in mass spectrometry and cryo-electron microscopy that will lead to longer and healthier lives. What if sustainable energy is just around the corner? Purdue Science student, faculty, and alumni researchers are working on more efficient solar energy, liquid car batteries, and quantum computing solutions that have enormous implications for the health of our planet. The Purdue Center for the Environment has formed a groundbreaking partnership with Peruvian university, Universidad Nacional de San Agustin on food, water, energy, and environmental research.